Someone once said “the desire to become a politician should automatically disqualify you from ever becoming one.” That doesn’t seem to apply to the ten politicians in this list, as they are all blessed with the name “Ken,” and they all pursued politics as their chosen career. Kenneth O’Donnell – O’Donnell was the right-hand man to J.F.K. and Robert Kennedy and was Presidential Aide to Lyndon B Johnson. Kenny also spent a lot of time with Robert Kennedy at Harvard University, where they were roommates. This friendship would eventually elevate him into a powerful position alongside some of the most influential players in U.S. politics. 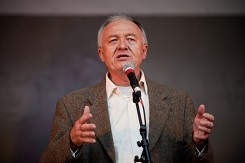 Ken Livingstone – The former mayor of London and an influential figure during the Thatcher Era in British politics as a staunch critic of the “Iron Lady,” Ken Livingstone is also the author of the much acclaimed book “If Voting Changed Anything they’d Abolish it,” which is a phrase still used by political activists to this day. Public reaction to Livingstone has always been mixed; however, only history will tell where his legacy lies. Ken Clarke – Ken first became interested in politics while attending Cambridge University in England, where he was President of the Union. His career in politics ambled along throughout the sixties and seventies, until he won the position of Minister of Health in 1982. It wasn’t long before Clarke rose through the ranks of British politics, and he soon became a household name. Ken Loach – An unlikely political figure, Ken Loach made waves in 2012 and 2013 by galvanizing the left in an effort to create a new political party in Britain – by the people and for the people. Loach proposed that politics in Britain was corrupt, and that the people must project the welfare state that was established after the Second World War. Ken Saro-Wiwa – This outspoken Nigerian activist fought against corruption is his home country, but was sadly executed without proper trial in 1995. The execution caused an international incident, which led to Nigeria being suspended from the Commonwealth of Nations for three years. Ken Saro-Wiwa is still regarded as one of the most influential figures in the fight against environmental degradation, and his execution sent shockwaves across the world’s political landscape. Ken Catalino – This conservative cartoonist has the ability to change the direction of the political landscape with the stroke of his brush. Ken Catalino mixes the political messages of the day with humorous cartoon illustrations that are typically conservative in their leanings. He is particularly critical of President Obama’s administration. Kenneth Lay – Unfortunately, this Kenneth is most synonymous with accounting fraud as the CEO of disgraced corporation, Enron. Lay died of a suspected heart attack while awaiting trial in 2006. The case was soon linked to the power-house political family of George Bush Junior and Senior when it was revealed that Lay had business dealings with the family. This, of course, was a theory that was propagated by conspiracy theory groups and news outlets. Ken Cuccinelli – Cuccinelli’s impact on politics is underwhelming, to say the least. He has supported a number of legislations and influenced laws in the state of Virginia, most of which his opponents say “set human rights back by decades.” Many of the laws surround immigration, healthcare and gay rights, which Cuccinelli is opposed to for reasons he has never adequately explained other than stating personal religious convictions. Ken Ard – This politician faced a number of ethics charges surrounding expenditure between 2010 and his inauguration as lieutenant governor of South Carolina. The charges surrounded purchases made in a woman’s boutique amounting to $800 and over $1,000 on personal meals. The Republican candidate ramped up 92 charges in total, all of which were for using campaign funds for personal gain. 23 of the charges cited that Ard failed to disclose spending that is suspected as being misappropriation and spending of funds. Ken Salazar – One of only two Hispanic Senators since 1977, Ken Salazar quickly rose through the ranks of the Democratic Party before becoming the 50th United States Secretary of the Interior under president Barack Obama. Salazar also served as the State Attorney General from 1998 to 2004, before running for a U.S. Senate seat, which he lost to candidate Mike Miles. He later went on to win in the Democratic primary, defeating Pete Coors of the Coors Brewing Company and eventually winning the general election for the Senate seat.